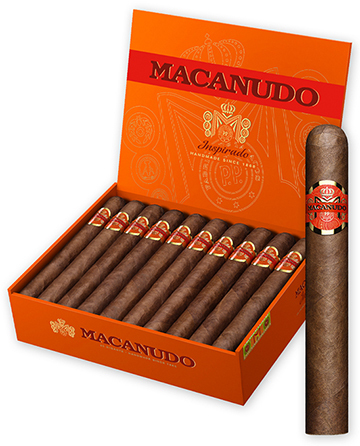 Macanudo's Inspirado Orange line of cigars has become a worldwide success since its 2014 debut in Europe, but it wasn't until 2016 that these delicious sticks were brought stateside. Now sold exclusively at brick and mortar cigar shops like Milan Tobacconists across the country, these spicy, sweet, rich, and complex cigars stand out from all others in the Macanudo portfolio. Hand crafted in Honduras, the medium- to full-bodied Inspirado Orange cigars are blended with hand-selected premium tobaccos from several of the top growing regions of the world. The Dominican Olor/Piloto Cubano, Honduran Jamastran, and Nicaraguan Ometepe fillers are bound in Honduran Jamastran and draped in a flawless Honduran wrapper grown in Olancho's San Agustin valley. The arrival of Macanudo Inspirado Orange may have taken longer than expected to reach the US, but we think you'll agree it was well worth the wait.